As a member of Minitab’s Consulting and Custom Development Services team, I get to help companies across a variety of industries create many different types of reports for management. These reports often need to be generated weekly or monthly. I prefer to automate tasks like this whenever possible, so that new or updated reports can be created without much effort. A little investment up front can save a lot of time by eliminating the need to recreate the wheel every time management wants a current report. I’m going to tell you how to use Minitab Statistical Software to automatically generate a report based on information retrieved from an external data source. But there’s a lot to cover, so I’ll have to do it in two posts. In this post, I’ll discuss automating analyses inside Minitab. In the next post I’ll demonstrate how to get Minitab “talking” to Microsoft Word programmatically using Minitab’s API. The end result will be a very simple automated report that exhibits the power of customization in Minitab. First, we need data! We can automatically pull in the current month’s data from an Access database. I created my own Table in Access for this example, which you can download here. Normality Test → Store the P-Value associated with the Test. Control Chart → Store how many data points are out of control. 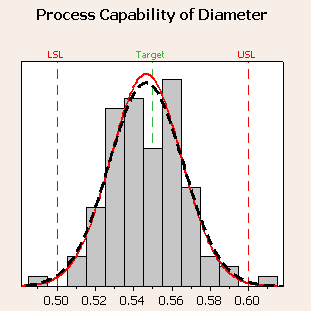 Process Capability → Store the Cpk statistic. Can you guess what the condition is doing? If you guessed that it pulls data corresponding to the current month, you are correct. Of course, SQL statements can be much more complicated that this example. Fortunately, Minitab lets you use the SQL statement that best fits your needs, no matter how complex it may be. Now that we’ve pulled the data in using Minitab Command Language, we need Minitab to run a few tests and create some charts. The constant K1 will now reflect how many points were out of control. If you save the above command language in Notepad using the file extension .mtb, you will have a Minitab Exec. You can run this file in Minitab by navigating to File > Other Files > Run an Exec. In the next blog post, I will describe how to utilize Minitab’s API in Visual Basic for Applications to generate the Capability Report.